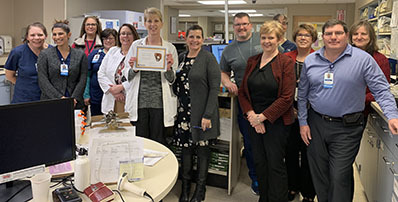 The December Good Catch Award goes to Greta Short, patient care pharmacist at Methodist Jennie Edmundson Hospital. for Privigen seemed low. She contacted the provider, who agreed it should have been a weight-based dose. to outpatient surgery to share with the RN. Great job, Greta, and thank you for your dedication to Methodist Jennie Edmundson Hospital and our patients!